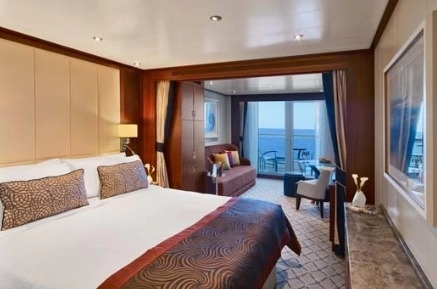 Details for Seabourn Ovation can be found below. 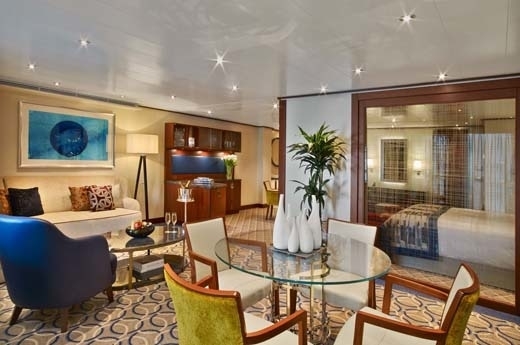 Re-Defining Ultra-Luxury Cruising...Again. As Seabourn celebrates 30 years of enriching and enhancing ultra-luxury cruising, we’re proud to introduce the next stage of our evolution. 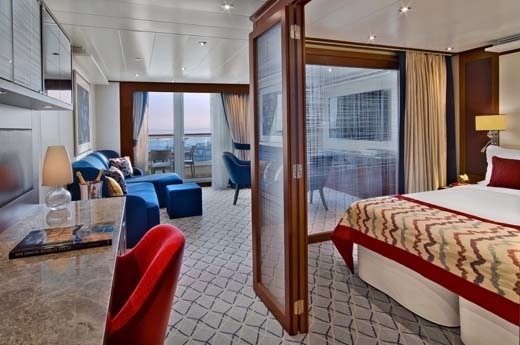 We welcome Seabourn Ovation, sister ship to the already renowned Seabourn Encore. 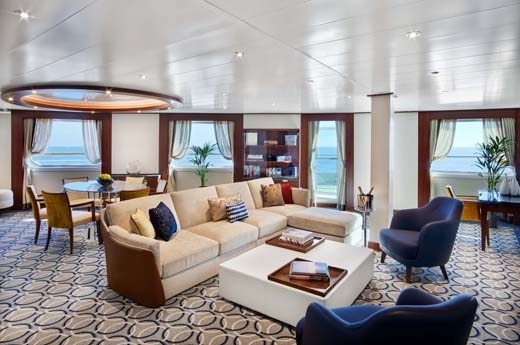 Her arrival has crowned a fleet that is already the newest, most modern and most acclaimed at sea and will deliver a wealth of new concepts, a fresh design vision and a host of illuminating ideas to delight the world’s most discerning travelers. As with Seabourn Encore and Seabourn Ovation, Seabourn enlisted the participation of master designer Adam D. Tihany. Recognized as one of the preeminent designers in the world, Tihany specializes in developing elegantly individual spaces for the most highly rated restaurants, hotels, resorts and spas in the hospitality industry. He is also renowned for his unique ability to realize and embody the particular personalities of his clients and the preferences of their clientele in his designs. Owner’s Suites feature full length window and glass door to private veranda, dining for four, separate bedroom, guest bath, two flat-screen TVs, pantry with wet bar, convertible sofa for one and whirlpool bath. Complimentary internet/Wi-Fi service. Approximately between 576 & 609 sq. ft. of inside space, plus one veranda of 142 & 900 sq. ft.
An invitation from the Master for a bridge visit when the ship is in port. A personal visit from the Hotel Director. Fresh orchids or potpourri in your bathroom. All-natural Molton Brown bath and beauty products including Pure Pampering bath oils. A large basket of succulent tropical fruits. High-quality bathrobes, soft and luxurious. A large bouquet of fresh flowers when you embark. A convenient espresso machine with a variety of coffees in your suite. Complimentary private car transfers between airport and ship. A choice of daily newspapers delivered to your suite. Wellness Bag exercise kit containing easy-to-carry workout gear available upon request. Internet access on board is subject to a nominal service charge based on usage. This nominal charge serves to limit usage to some extent and thus improve the performance for all our guests. Guests simply register at the Seabourn Square terminals to set up an account, which is charged to the guest’s shipboard account. The basic charge is 40 cents ($.40 USD) per minute. Several different advance purchase plans are available on board at lower rates, to accommodate individual needs. Time purchased as a plan may be used at any time during the cruise, either at the terminals or wirelessly. Wintergarden Suites feature large windows with ocean views, dining for six, bathroom with whirlpool bathtub, guest bath, Glass-enclosed solarium with tub and day bed, pantry with wet bar, and two flat-screen TVs. Complimentary Internet/Wi-Fi service. Approximately 989 sq. ft. of inside space, plus one veranda of 138 sq. ft. (17 sq.m.). 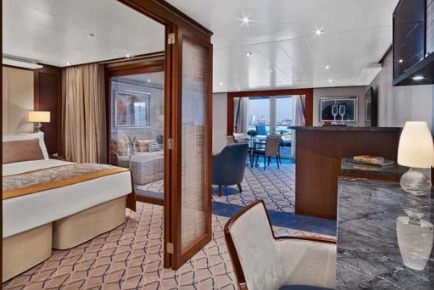 write a review of Seabourn Ovation.